Everything you need, nothing you don't. This years Mystic Drip not only looks the absolute part on the water but is also equipped with enough tech and quality neoprene to keep you riding in the harshest of conditions and still look fashionable. With Mystics new printed sleeve design, super flexible and soft touch M-Flex neoprene you wont be thinking about the cold but rather focusing on your riding. The tech in this suit is enough to back up any sales pitch of ours: featuring glued blind stitching to prevent any cold water from seeping through the stitching into the warm interior, the Mystic Drip has been stitched half way through the neoprene without fully perforating it. The remaining half is then glued shut to create a more effective overall seal. 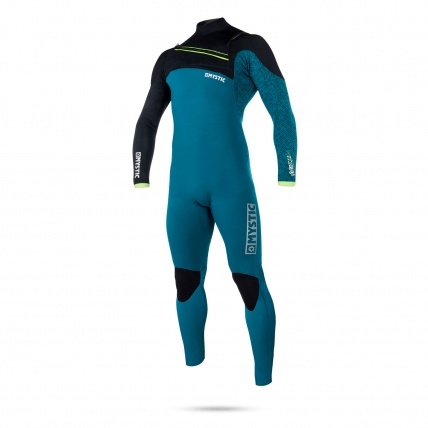 Only to add to the durability of this wetsuit, Mystic have taped the critical areas of the seams where there is often more stress on the stitching in order to put an extra layer of reinforcement and create a better seal. The Mystic Drip's mesh neoprene back panels deflects wind keeping your core nice and toasty while inside polar lining keeps the heat contained. Finishing off this tech madness we have a glide skin neck construction for added comfort around the neck and Aquaflush perforated neoprene on the calves to prevent any over accumulation of water (or jelly leg).